Tap water in downtown Lanzhou, capital of northwest China's Gansu Province, has been found to contain excessive levels of benzene, provincial authorities said on Friday. 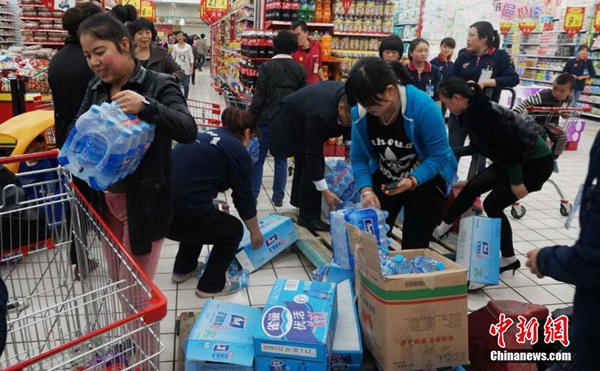 Residents in Lanzhou rush to supermarkets to buy bottled water after local tap water was found to contain high levels of benzene Friday. Tests carried out in the early hours of Friday showed that tap water contained 200 micrograms of benzene per liter, far exceeding the national limit of 10 micrograms per liter, according to the city's environmental protection office. According to supplier Veolia Water, tests on Thursday found that tap water contained 118 micrograms of benzene per liter. Veolia Water is the sole water supplier for more than 2 million people in urban Lanzhou. The local government is investigating the source of the contamination. Benzene is a colorless liquid which is often used to make plastics. Excessive benzene can increase the risk of cancer.